After getting home, I patted myself on my back for exercising control in my spending, and took a long nap and had the most pleasant dreams, combing through these beautiful wools all over again. I am delirious over textiles! I was preparing to go to church when the phone rang. It was the sale’s ladies calling me to see if I was interested in purchasing more wools. Apparently they had some left. I told them that I would have to call my husband and get permission, and call them back. We are on a tight budget and we had had recent serious discussions about my weeny craft income and the need to use it to pay some bills at home. My husband, bless his heart, gave me permission to do what I needed to do. I think he trusts my judgement and knows that my sewing survives on good deals. I called the sale ladies back and minutes later I was en route to this sale over a half an hour from home. On the way there I had the chance to think about what monies I had earned and what future sale entries I was already committed to, and do some mental math. Truly I didn't have much to spend. I arrived with my car smelling of burnt rubber, and the sale lady noted that one of my front wheels was smoking. We both surmised that I had perhaps driven at least a few miles with the emergency brake on which was no accident to be sure! All the way there, I was trying to put the brakes on to what could be “out of control spending” for following my own inclinations and wants, I could have considered remortgaging the house to buy such beautiful wools at the right price. After all, my name is Jane and I am a fabricaholic and wools are expensive to buy at full price. My mental math had helped me decide upon a limit and stick to it. Their prices were more than fair to begin with and I would simply purchase more and advise them to sell what was left on Sewitsforsale.com. 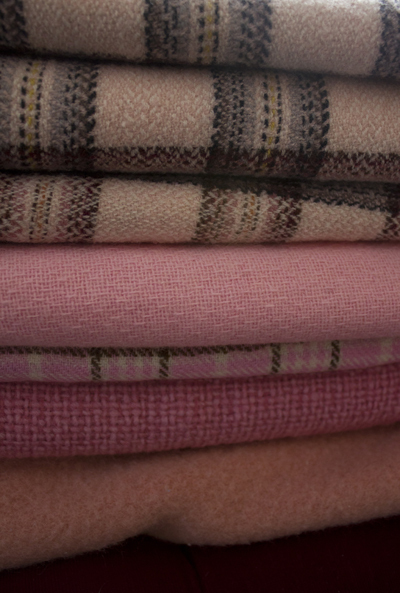 With no woolen mills left in this country, wools are in scarce supply and are so valuable that they don’t last a day on this site before they are all sold. I was at one with these "women of the cloth" as well as the family of the deceased and wanted them to get a good price for their already well-priced goods! A shrewd business woman I will never be! When I indicated that I was a person of modest means, the sales woman asked how much I could spend and I gave her my top dollar, and gave her the rest of my prepared spiel. I grabbed my large red nagahide sale bag and headed toward the house, eyeing one large kitchen bag full of wool sitting on the lawn and asked it that was what was left. She laughed and said, “Goodness no!” and indicated that my huge big red sale bag wouldn’t do at all! I was then led to bags and bags and bags of wool materials! Their turn out was not what they expected, and my meager offer was apparently adequate enough to make me the winner of all the remaining wools, though there was another woman that had called, and I encouraged them to call her back to maximize their earnings, as there was surely enough for her and I both, especially with my limited monies! No, their sale was over and they weren't interested in the scalpers and scavengers. I had attended the sale and bought in its early hours and then came back and didn't try to get more than my money would buy! I was to get what was left and if I couldn’t use some of these wools, I was to pass them onto a local charity in my town. I readily agreed and marveled at my good fortune and the sales woman's generosity! We then packed my car and I could not believe what I had just done! I was delighted, and scared and overwhelmed. Our house, garage and storage sheds were already on overload and in need of thinning out! We had had family fights over what should be saved versus thrown out to make space for all we had too carefully saved over the years! 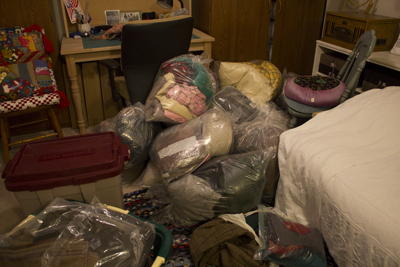 Truly, the quantity of wools I was bringing home, really meant that my children needed to move out to make room for them! I wondered if these bags would be the final straw and perhaps my family would elect for me to leave instead? Hard decisions will fill the days ahead to be sure. I likely won’t be disposing of either of my children, and though tempted, I believe that my husband and children will keep me as well. My youngest is to get an apartment of her own soon and there will definately be no empty nest here! In the course of the evening, my shock lessened, and I realized that such an acquisition was really a boost to my business and not just to the headaches of sorting and storing it! I continually think about my nursing license that is quickly slipping by as I am not well enough to put in full days of work and fifty are needed before being able to re-license in March. My husband has been encouraging me to give it up for my health’s sake. I don't seem to have a choice at this point…and here it is, another sign from God that while one door is closing, another is opening wider and wider. I am moving from a hobby business to something perhaps more serious…seriously fun and something that I can hardly wait to get to each day! This Labor Day Sale was truly a commitment to the labor I most love! I am indebted to this sale and the generosity of those who selected me for these precious wools that have become a gift for future labor and love. I hope to make them proud of my use these beautiful materials and I have changed my philosophy about cutting all my materials before I die! I am grateful for the freedom to pick and choose what I do with these materials, and I shall allow those that follow me to do the same! I am a steward to this collection, though I will use what I can before passing on the rest. And if I am lucky enough to be a Grandma Jane, and live to be one hundred and one, there may be less rather than more to leave behind. This writing brings to mind the many others whose contributions are making my craft business possible and I want to thank them all! It is my belief that traditional needle arts are such an important tradition of our past, and need to be taught and preserved in our day so that future generations may still enjoy, create, and pass on these traditions! My sewing instructors through the years, including my mother, and the many who have passed on their scraps, and hand-me-down wools and craft items, as well as J.S., who sent me boxes of used wool clothing for only the price of shipping during my first days of business are among the many who have encouraged my continued creations. I have also been nurtured and supported by my customers who enjoy my creations. Your positive feedback has truly been a life line! Can your pincushions that are in your slide show be purchased? I've seen some that are not part of the Etsy page. In other words do I have to buy through Etsy? Also, do you make custom pincushions from an idea from someone? Oh Jane, you sound so excited! Wonderful.I know you were there first, but your sweet personality helped close the deal I'm sure. Dear Cindy, thanks for your feedback!! New news..I might be able to maintain my nurse license in NY versus VT...and we live close to NY anyway?!! They don't have the same requirements for work hours!Perhaps our nursing is best used on our own care sometimes! Hang in there!! And take good care of yourself!